Four separation fence security guards fired at a group of five journalists who tried to approach people demonstrating against the fence near the West Bank settlement of Efrat on Monday afternoon. Photos taken by AFP photographer Moussa al-Shaer clearly show one of the guards using an Uzi submachine gun to fire at the demonstrators. 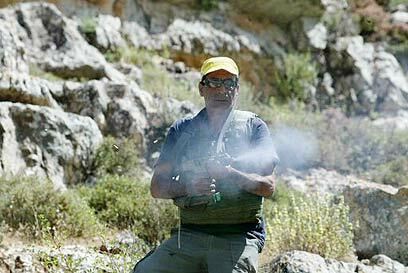 The other guards fired with live ammunition in the air, although they were not in danger at any stage. 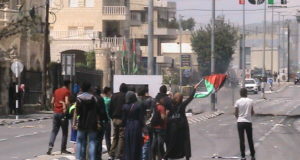 Al-Shaer told Ynet, “We tried to move to the other side in order to approach the Palestinian and foreign demonstrators. One of the security guards began shouting and firing directly at us. He did not warn us first, he just opened fire. His friends also fired in the air. “We shouted to them, ‘We are journalists, are you crazy?’ But they continued to fire for about 10 minutes. There were four security guards and they were standing about 7 meters (22.96 feet) away from us when they started firing with live ammunition. 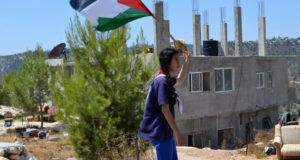 Fadi Tanas, a reporter for the Palestinian news agency Maan, said that it all started in a quiet demonstration held by the Palestinian protestors against the laying of infrastructure in Efrat. The demonstrators, Tanas said, did not put the guards at risk at any stage and did not hold one stone. Fifteen minutes after the incident army and police forces arrived at the area. They were briefed by the security guard on what happened and then arrested two of the demonstrators “apparently following an argument,” according to Tanas. Residents who were at the area also confirmed the details of the incident. One of them said that the guards had acted in a way that endangered lives. “We can argue with soldiers, but these people were unwilling to hear and unwilling to talk. Only shouts, curses, threats and gunshots, a lot of gunshots. The incident could have ended with many casualties, not only journalists,” said Jamal, a resident who took part in the demonstration. The five journalists – from AFP, Reuters, the Palestinian news agency Maan and a Palestinian internet media outlet – managed to escape the incident unharmed. Military sources said in response that a Defense Ministry security guard fired one shot in the air. 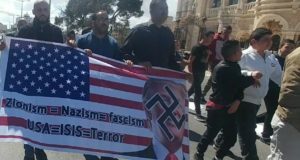 According to the sources, a guard was lightly injured by stones hurled at him and two protesters were arrested during an anti-fence demonstration of about 100 Palestinians, left-wing activists and foreigners.